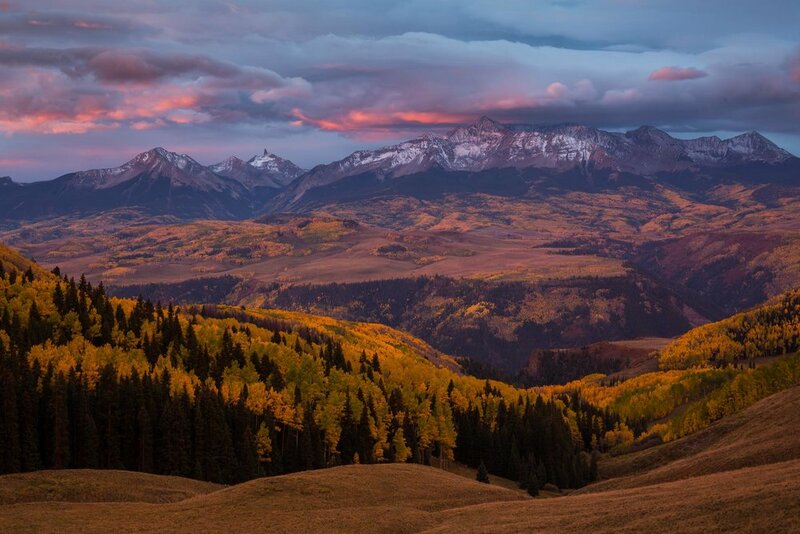 TELLURIDE, CO is one of the most majestic, unique mountain towns in the entire world! Join Andrew for this EXCLUSIVE workshop with only four students total. The group will visit some of the most iconic locations, and several lesser-known, off the beaten path gems. Sign up fast, spots are VERY limited! If you've been to Telluride, then you know. If you haven't, then you really need to. 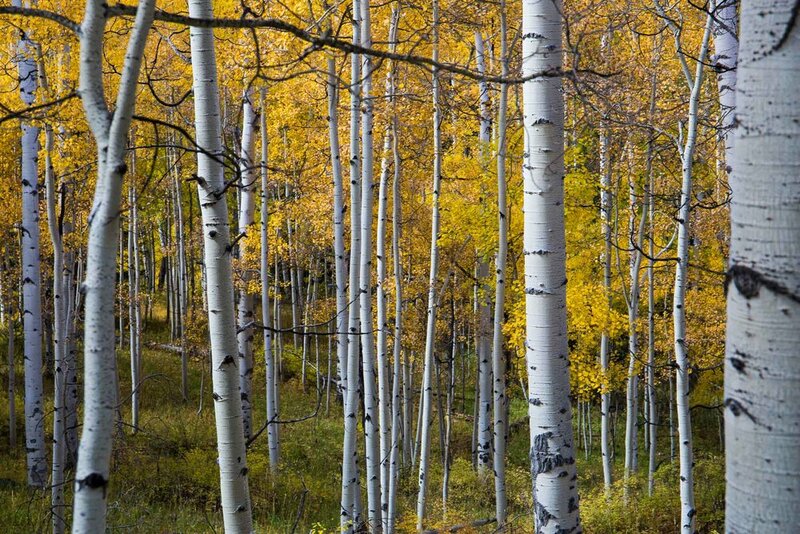 It is America's most stunning little mountain town. 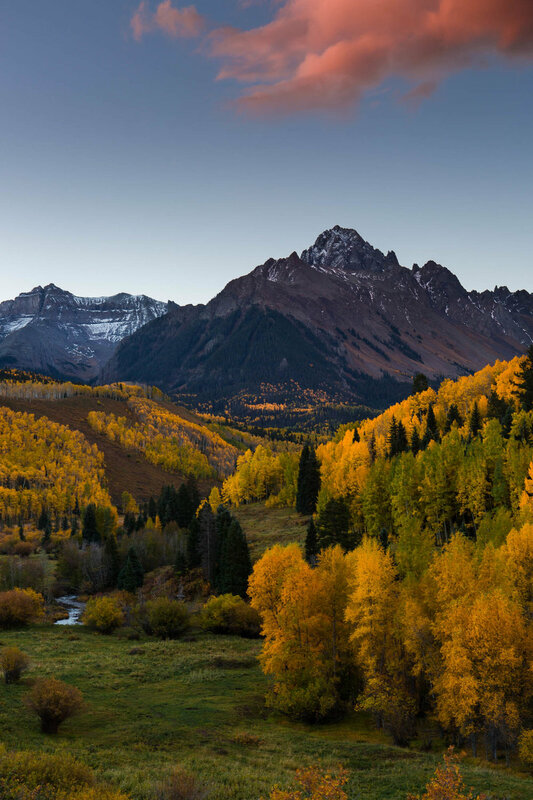 Charming, quaint, and downright idyllic, the locals are quick to tell you that they left everything behind in their former home to live the dream in the gorgeous box canyon town of Telluride. 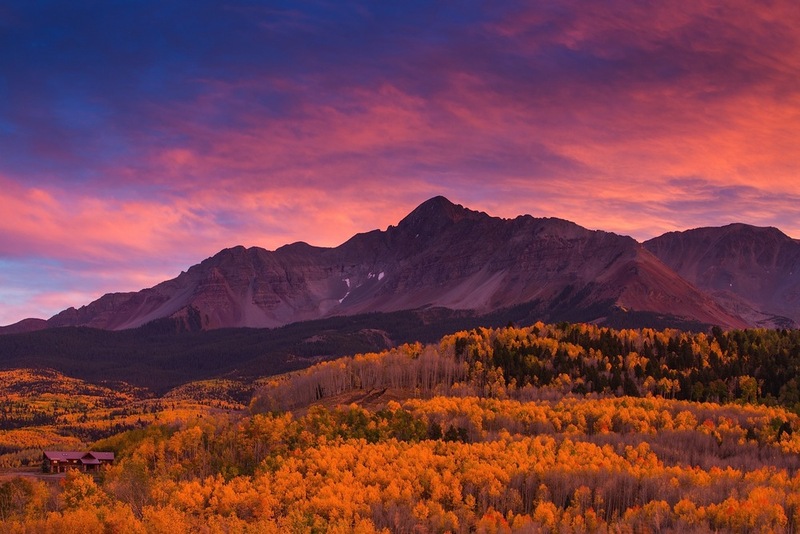 Surrounded by the San Juan mountains of southwestern Colorado, Telluride is the perfect jumping point for countless off the beaten path locations to shoot and capture the beauty of nature. 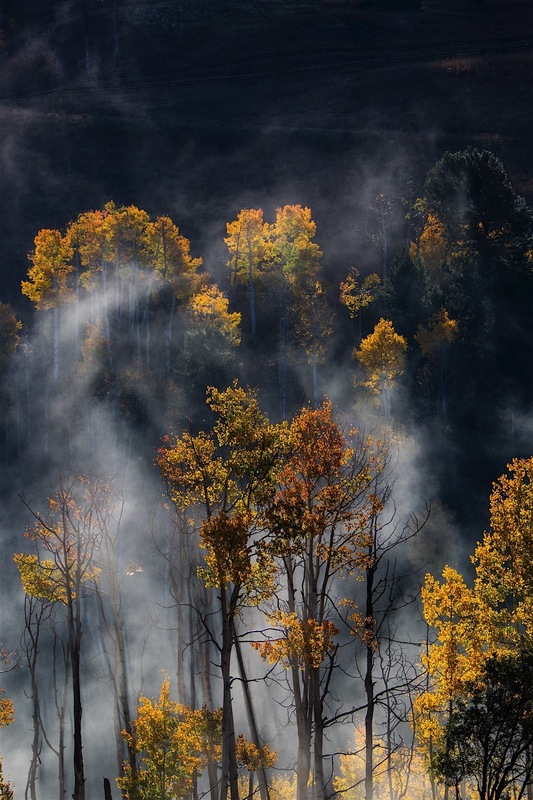 Chasing mountain light best characterizes these two workshops, but we will also focus on general landscape, mountains, fall colors, waterfalls, basic post-production workflow, plus much more! Pre-workshop Personal Skype Session – Before all of our destination workshops, you can benefit from a personal Q&A Skype session at your convenience with Andrew, to ask any questions you might have about your upcoming trip. This is immensely helpful to gat to know your instructor, and to making sure you feel prepared for the great adventure ahead. Welcome Packet - You will receive your personalized welcome packet 2-6 weeks before the workshop with maps, helpful local info, nature facts, FAQ’s, technical photography information on what we will be discussing, a comprehensive list of what to bring, and more. 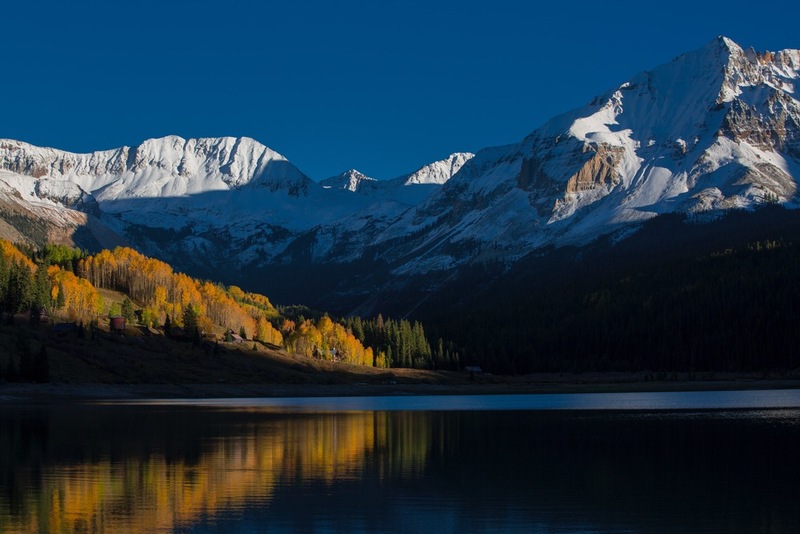 A Guided Experience – I will have you in the right places at the right times to capture the very best Telluride and the surrounding areas have to offer! We also may embark on a hike or two per day through the intensely beautiful landscape of the San Juans. The availability and intensity of these hikes will depend on the abilities and desires of the group. We will explore the myriad flora and fauna of the ecosystem, shooting anything and everything in nature, discussing a wide range of photographic tips and techniques. 4 Nights Lodging, 2 Dinners, Wine & Cheese Reception, Transportation, Water, and Snacks – We will be staying at a comfortable and convenient multi-story house or condo in the town of Telluride (or similar - exact lodging to be determined at least 30 days prior to event, cost includes double occupancy, though private rooms may be available at extra cost), wine and cheese reception, 2 nights out to dinner in Telluride (Rustico, La Piazza, 221, etc.) and plenty of bottled water and snacks throughout the day will be provided. BONUS! - Stretch out those sore muscles! One complimentary yoga session per day, with our lovely resident, certified yoga instructor, Ellen Slaton. What’s NOT Included? Lunches and 2 dinners are not included, though we will try to eat together as much as possible, since it's a great chance to continue talking shop. Transportation to and from our house in Telluride is also not included, as well as anything not specifically listed above. Travel insurance can be purchased separately, HERE, but not necessary. Price - $2750 (Double Occupancy) or $3500 (Single Occupancy) which includes your pre-workshop materials and Skype Q&A, 4 days of photography instruction, 4 nights lodging (Thurs. – Mon. ), wine and cheese reception, 2 nights out to dinner in Telluride (Rustico, La Piazza, 221, etc. ), bottled waters and snacks in the field, transportation once workshop begins Thursday afternoon, and photo feedback and discussion sessions. Transportation to and from Telluride, lunch, and any other expenses are not included. Deposit - A refundable* $500 deposit (min) is required to secure your spot. Class Size - This class will have at most a 5 to 1 ratio of students to instructor. A minimum of 2 participants is required for this workshop to occur. Discounts may be available for multiple people in one party, and friend referrals. Travel - Telluride is somewhat remote. However, there are a few airports within a reasonable driving distance. The largest nearby airport is Montrose Airport (MTJ), which is about 70 miles away (1.5 hr drive). There is also a local airport in Telluride (TEX) which is 5 miles away (10 min drive). Lodging - We will be staying in the lovely town of Telluride at a comfortable and convenient house or condo all four nights. Meals - 2 luxurious dinners are included at Tellurides most notable culinary experiences. Plenty of bottled water and snacks throughout the day will also be provided, but other meals are the responsibility of the student. There are many restaurant options, and that is where we will tend to eat as a group, so please make arrangements with Andrew if you have special dietary needs. Transportation – Once we meet in Telluride at the condo on Thursday afternoon, Andrew will drive everyone to each location. If you tend to get motion sick, please bring medication as some of the roads we will drive are quite windy. Thursday - We will be meeting at the condo in Telluride promptly at 3:00pm, we will check in, have a quick orientation, and then head out into the field as quickly as possible to have some fun! Please be sure to give yourself enough time to get to the town on time, as we will hit the ground running and not finish until later Thursday night, after a sunset shoot. Friday - Rise early to photograph sunrise at one of our morning locations. Break for lunch together with discussion. We will find a nice, quiet spot to rest. Regroup at 3 or 4 to hike and explore for the next location to shoot afternoon/ evening light. Break for dinner together, then shoot sunset. Saturday - Rise early to photograph sunrise at one of our morning locations. Break for lunch together with discussion. Around 3 or 4, we head to hike and explore for the next location to shoot afternoon/ evening light. Break for dinner together, then shoot the sunset. Sunday - Rise early to photograph sunrise at one of our morning locations. Break for lunch together with discussion. Back to the house to do post production and workflow together. After some rest time, regroup at 5 to shoot afternoon/ evening light. Break for dinner together, then shoot sunset. Monday - Rise early to photograph sunrise at one of our morning locations. Break for lunch together with discussion and image critique. We will then end the workshop after checking out and a fond farewell... until next time!